Many metro area families build their holiday traditions around trips to see Christmas lights in and around Oklahoma City. Each year, the area comes to life with hundreds of brilliant displays from November through January. Whether you want to make a memorable holiday event during your trip to OKC or you just want to drive by and bring a bit of holiday cheer to your family, there are a few excellent opportunities in and around Oklahoma City to do so. 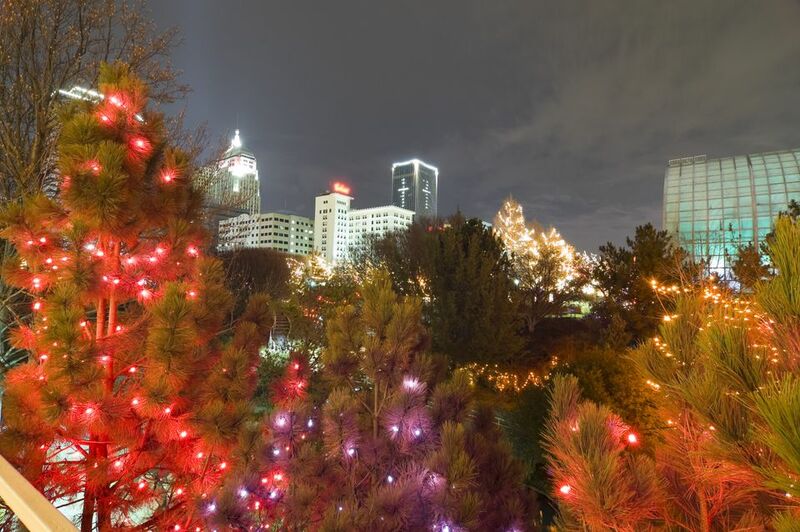 From exploring downtown Oklahoma City's many public and private lighting displays to driving through festively decorated neighborhoods, you're sure to discover something fun for the whole family on your trip to central Oklahoma this holiday season. Starting off with the opening of the Devon Outdoor Ice Rink at the Myriad Gardens in early November and lasting until the end of January, the Downtown in December Festival in Oklahoma City provides plenty of opportunities to see dazzling light displays and take part in classic holiday traditions. For a special view of the downtown neighborhood's many Christmas decorations, you can hop aboard a free water taxi on the Bricktown Canal on Thursdays through Sundays evenings. When you're finished, you can enjoy even more lights on the streets of Automobile Alley. Events featured during the annual Downtown in December celebration also include the Christmas tree lighting ceremony on the Friday after Thanksgiving, the Winter Market the following Saturday, and the SandRidge Santa Run. Located in the northwestern corner of the OKC metropolitan area, Yukon has become known as one of the most festive suburbs of Oklahoma City. Each year, the city's Chisholm Trail Park hosts a drive-through Christmas wonderland from Thanksgiving through December 31. Since 1995, Yukon's Christmas in the Park has only continued to grow and expand, now featuring more than 425 incredible light displays stretching three miles and 100 acres near downtown Yukon. Admission to this brilliant lighting display is free, but donations are accepted at the end of the drive-through. You can also pay to take a ride on the Santa Express Trail train from the Chisholm Trail Park train depot. In addition to the big, professionally organized displays such as Christmas in the Park, you can always spend the evening cruising around the neighborhoods and suburbs of Oklahoma City. There's more than a dozen programmed light shows happening each year throughout the metropolitan area, and although these displays were installed and programmed at home, they often rival the professional displays set up around the city. Among the local favorites, the Downs Family Christmas display in Norman is outstanding, as is the multi-house display on Markwell Avenue in OKC, just off Northwest 20th Street. Most of these displays officially launch around the Thanksgiving holiday and go nightly through Christmas or New Year's Day. Also known as Illumination Celebration, the Holiday Lights Spectacular of Midwest City has become one of the region's favorite holiday destinations. Although it started small in 1995 with just 44 displays, Illumination Celebration has expanded to become the largest in the region with more than 100 animated lighting displays, more than one million lights, and a 118-foot-tall Christmas tree all found in Joe B. Barnes Regional Park. The Holiday Lights Spectacular is open from the weekend before Thanksgiving through the end of December. Admission is free. Although a little more than 45 minutes south of the city, Shannon Springs Park in Chickasha is certainly worth the trip during the holiday season when you can experience the annual Festival of Light. First started in 1992, the Chickasha Festival of Light attracts visitors from across the country and includes an animated, musically choreographed light show, hot chocolate, camel rides, and casual strolls around the well-lit park and pond. This free event runs from Thanksgiving through the end of December, and you can also take bus tours, carriage rides, Ferris wheel rides, and pictures with Santa Claus for an additional fee.